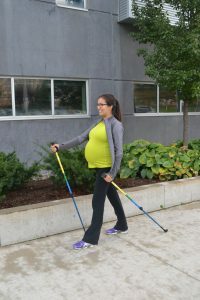 How Urban Poling helped a Mom-to-Be! If you have ever been pregnant or know someone who has been, you are probably aware that there are many myths/old wives tales associated with pregnancy (ie: Sweet/Salty cravings to predict gender). One of the most talked about myths is the idea that you “cannot exercise while pregnant”. Luckily, research has debunked this myth and actually supports the opposite. Maintaining regular exercise during your pregnancy is shown to help improve those common discomforts (fatigue, back pain, poor posture) as well as reduce the risk of gestational diabetes for mom and lastly help facilitate a easier labour and recovery. “I was first introduced to Urban Poling a few years ago while I was working at Humber College. At the time, I was going into my third trimester of pregnancy and could feel added instability in my knee from an old injury. I was always physically active and still wanted to exercise but needed to work within some new limits. For many reasons, low impact activity such as walking was the way to go. 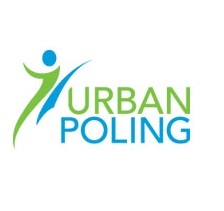 It was right around this time that the Urban Poling certification course was being offered for fitness instructors and staff in our department. I decided to register and noticed right away that walking with the poles increased the muscle activation in my shoulders, arms, and core which promotes a healthy posture. I felt very stable when walking while still getting a good full body workout. What’s more, I could scale the workout up or down depending on how I was feeling. Today I still enjoy the poles for the added muscle activation and think they are great for active recovery days, lunch breaks at work, and keeping a healthy active lifestyle. As always, before engaging in any type of exercise, please consult your Health Care Provider to ensure it is the right fit for you !